But it’s really toughest on children, who just want to play outside and be “normal” kids. 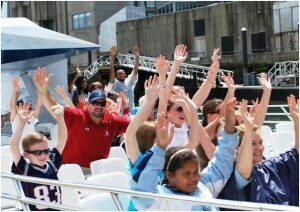 That’s why Jen and I were so excited to host young cancer patients from Dana-Farber Institute for a wet and wild, high-speed boat ride around Boston Harbor a few weeks ago – our third annual Codzilla cruise! For those who don’t know, Codzilla is a fiery red speed-boat painted with shark-like “teeth” that flies across the water at up to 40 miles per hour, blasting everything from Doo Wop to AC/DC. Its creators call it a “water coaster” and I can personally attest to its ability to elicit screams and soak its passengers. And Jen and I would especially like to thank Boston Harbor Cruises’, who were nice enough to let the JAF take over Codzilla for the afternoon! The kids had so much fun, yelling and waving their arms in the air as we shot around the Harbor. They also had a good time trying on my Super Bowl rings and posing for pictures. It was a beautiful, sunny summer day on the water, and I truly believe the fresh sea air gave everyone a much-needed boost in spirits and health. It’s so important to get out of the hospital and forget about cancer, even if only for a few hours. 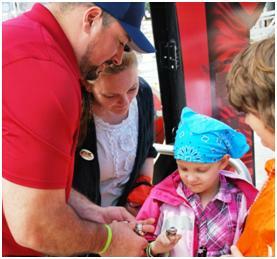 Many of these kids are not allowed much time outdoors during treatment, and it felt really good to give these kids and their families the opportunity to get out, set their worries aside and recharge. It is also a great reminder that – no matter what adversity they face – kids will be kids, and will find joy all around them. That indefatigable spirit is truly infectious. Jen and I hope they’ll treasure this summer memory – full of fun, laughter and thrills – as much as we will.